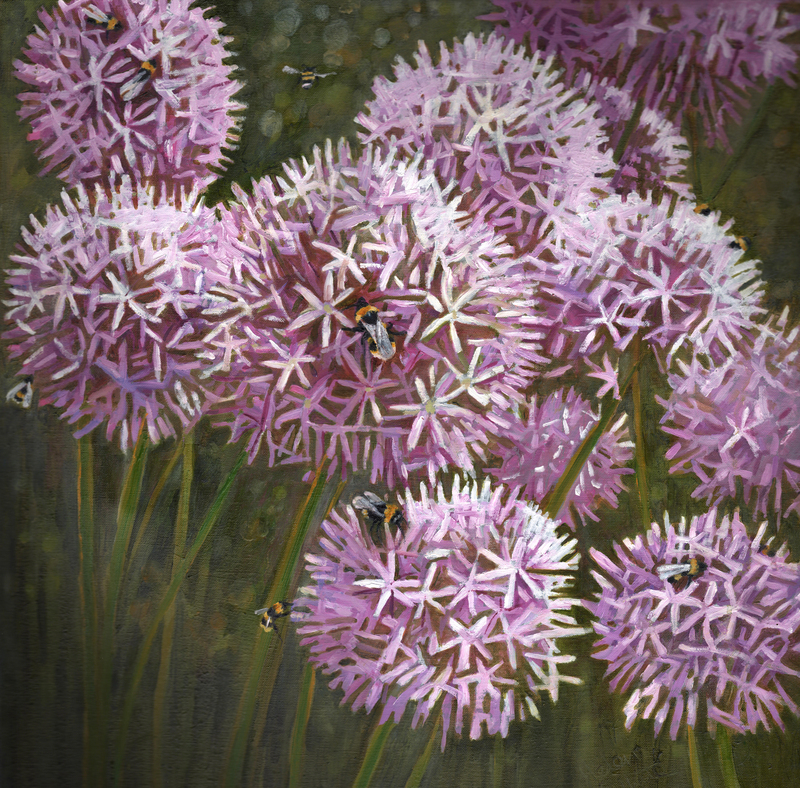 When it came to painting alliums in June, it seemed so natural to include one or two bees busying away in the radiant summer flower heads…so I did. By the time it was finished, eleven bees had made their way into my painting, becoming almost more of a ‘subject’ than the flowers themselves. Then, as the now-dry painting made its way onto my website this month, my thoughts turned to writing about why this was; and, more particularly, why bees have always been so precious to me, almost some sort of totem, yet I found myself unable to fully explain…until it came to me with ease while I was out on one of my walks. Two weeks back into the throes of ‘work’, I am so cognizant of loving ‘what I do’ with every fibre of my being. I paint for hours, knee-deep in the kind of flow that has me tingling and stomach flipping with excitement as I reach for my brushes. I also spend hours ‘administering’ all the ever growing, spreading, blossoming aspects of my business, which include updating social media and writing my two blogs, setting up and maintaining online galleries, answering emails, starting on writing my book, making new contacts, tweaking multiple websites, keeping all of my media newsworthy and up-to-date, sending out newsletters, entering and organising exhibitions, ordering materials, talking to galleries and clients, processing photography, scanning and Photoshop-ing…the list goes on. A typical day is split between four of five hours paintings and just as long spent on a computer yet nothing is fixed or prescriptive. Suffice to say I relish every bit of it and am often still ‘doing it’ very late at night or at weekends because its what I LOVE to do. Then, everyday, the rewards of all my enthusiasm seem to keep piling back through the door…last week the notification that I’d been awarded an American Arts prize, this week invited to join the ranks of select contemporary artists represented by Bridgeman Images; I’ve just been accepted into the most dynamic online art marketplace and have had almost an offer a day from both physical and online galleries for the past few days. Just a short while ago, a note was popped through my door with a ‘thank you’ from a charity that raised a significant sum by auctioning my donated painting. Chance encounters with my work trigger synchronicities and wonderful messages from people in far-off places. One thing keeps leading to another, so much cross-pollination occurring as a result of ‘chance’ encounters that catalyse whole sequences of events which I then watch unfold with an awe that never lessens. So much to feel good about, to keep life varied and colourful and plenty of choices and potential – its already all I ever thought I wanted from my ‘work life’ but then all the enthusiasm I pile into feeling grateful for this reaps further dividends, more growth and expansion which is, after all, how life works. None of this is a boast, just an observation I’ve been making for some time and keep on making and expanding every day. The observation is this: I can’t help but notice that in doing what brings the most inherent joy, that very thing that most suits our passions and our innate skills, we contribute so much more to our own wellbeing, and that of everyone around us, than we ever could by doing something that involves compromise, struggle, sacrifice or what is often labeled ‘the right thing to do’ according to some outmoded belief system. More, when we follow this route, we affect people we never even get to meet, in fact the upward spiralling vibration of the whole planet…’just’ by holding our own buzzing vibration of absolute bliss, our own ‘single-minded’ focus upon whatever brings us an out-of-this-world thrill – which actually equates to the highest vibration that we can embody in life. Such a ‘high-vibe’ can’t help but strobe out from us like a beacon of enthusiasm that others can only ever be positively influenced by, in so many countless ways, inspiring and uplifting them, demonstrating in action what is really possible and how circumstances conspire to make everything pull together when we do what we truly love to do. When we embody so much enthusiasm and positivity in what we do, we can’t help but spill that enthusiasm over the edges of our lives in a way that affects everyone around us…and what we ‘produce’ from our efforts holds that high note, that taste of what is possible, the sweet flavour of what we have managed to create out of the circumstance of choosing to live in our own ‘sweet spot’, meeting our potential, guided by a feeling of joy. What I love the most is how my days flow with the wind; how I catch a new scent on the breeze which, if I choose to, I breathe in (my ‘inspiration’) and so this fresh impulse determines what I then ‘land upon’, which is where I stay for as long as it takes to drink my fill and then I flit off to somewhere new. When I feel like a leg-stretch and a breather, I take my dog for a walk…yet even those walks feed back into my output as the photography and the experiences that colour my paintings and this blog, as does everything I experience. Whatever I ‘taste’ of life, all my highest experiences of radiance and joy, feed straight back into the flavour of my ‘output’ – colouring what people see but also impacting their senses in far subtler ways that rely on vibration. In short, there is no compartmentalisation of ‘work’ and ‘non-work’ life; my life and someone else’s life – its all about synergy. Artists, composers, creatives of all kinds have played with this synergistic way of being since the dawn of time…but, in effect, we all do it. We plug directly into it as soon as we follow where our most blissful sensations lead and start to create from what tastes the sweetest to our particular taste buds, which can’t help but flavour all that we then send out into the world for everyone else to sample, savour, maybe not enjoy so much…which is fine, everyone has preferences…and its all good. We can’t NOT produce our very best work when we live like this and others will resonate much, or not so much, as they please – not everyone loves honey but the world is a far better place for having it there as an option. There in describing my life, in essence, I find I have also described the busy bee…busily doing exactly what it is happiest doing, day in and day out, single-minded and focused, fully immersed in what is the sweet-smelling raw material of its toil, flitting from flower to flower, leading inevitably towards the sweetly nutritious output of all its efforts, subtly ‘coloured’ by all the variations, subtleties and scents of whatever it has sucked upon. Heather or lavender, clover or orange blossom, no two strains of honey are ever quite the same because all of the the individuised ‘colour’ comes directly from its experience; like the perfect record of the bee’s inspired life, choosing in each moment which brightest flower to go to next. 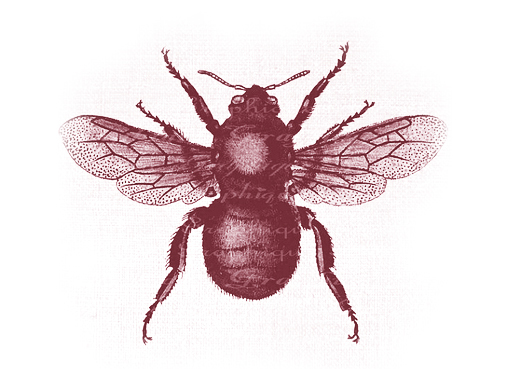 For all its apparently random flitting here and there, an impressive super-structure awaits the bee back at the hive where pursuing its own wellbeing slots into a complex pattern of serving the group wellbeing in the most intricate and beautiful way imaginable. More, there’s a game plan or purpose far far bigger than itself that underlies everything that the bee does as it works in absolute synergy with the whole of the planet because, without the bees ‘doing what they do’, our crops would fail and the planet as we know it would wither away. So what if I could suggest to you that in following your own personal bliss, in doing that one thing that only you know, deep down, would make your heart sing its highest note, you too would make the same kind of impact upon the wellbeing of this planet as the bee makes every busy day following its bliss? What if I suggested that the wellbeing of the planet depends upon as many people as possible following their own bliss and overspilling their enthusiasm; that such people carry so many others on the shoulders of their inspiration and joy, the high note of their passion? That without those that dare to believe ‘they can’ and who share everything that they are, without apology, we would all lose heart and expire? What if believing you can’t do such a thing or that such a life is ‘for other people’ is just a meme, a false reality that you have stepped into like a dark cell that blocks out your view of the sky, the walls of which will dissolve away as the illusion they really were at the very end of your life…or you could choose to dissolve them consciously now? What if the only regrets you are likely to have at that time are the things you didn’t do, didn’t see? What if fear is your ONLY obstacle? What if stepping into your passion unleashes a creative force in you that moves everything up a gear and makes those old doubts obsolete because you could not have anticipated how wonderfully things would turn out from the very limited place you were still seeing them from? What if you could do all the rationalising in the world, making lists of all the so-called pros and cons of doing that thing you really long to do and still not have any more reliable guide than the way just doing it makes your heart soar? What if you could really accept that, rather than being an act of selfishness, the step of following where the heart leads would be the greatest gift you could ever offer-up to those you love, everyone you know, many you don’t, indeed the whole planet…as well as yourself, and that things have a habit of working out surprising well and of orchestrating around you, as soon as you take such a step with nothing more than the vision that you can? Last but not least, something else I’ve noticed – why all this reticence to shout out about our good news and why is it the cultural norm to keep quiet, bashful and politely understated when it comes to things going GREAT for us and when there’s success and happy outcomes to shout about? Perhaps if we all made a real hum about all the good stuff and if the real buzz words in our culture were those that are all about encouragement and shared joy, it would drown out all the negativity that dominates our airwaves and feed into the creation of even more wonderful outcomes for many more people to pipe up about…just a thought! So, maybe all of this is some of what I was contemplating, celebrating, wanting to convey…deep deep down…when I decided to paint eleven busy bees ‘working hard’ in the high summer sunshine. Awarded fourth place American Art Awards 2014 for The Yellow Window in the category ‘realism still life’. This award received hundreds of entries from 51 countries and is juried by 25 top US galleries. Am very thrilled! Have become the latest artist invited to join Bridgeman Studio, the online platform for contemporary art licensing offered by Bridgeman, the world’s leading specialists in the distribution of fine art, cultural and historical media for reproduction. This makes my artwork readily available for a wide range of commercial purposes. 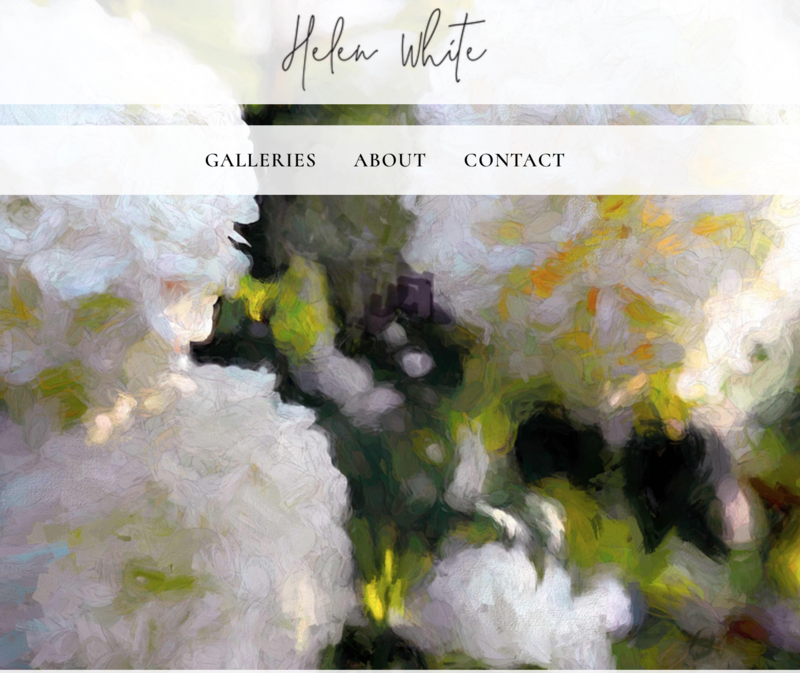 Helen White shop front newly added to ArtGallery.co.uk, the most dynamic online art marketplace that enables artists to deal direct with their customers. This makes my originals much more accessible to a much wider market with secure payment methods and satisfaction safeguards in place; it also makes the wonderful Own Art interest free payment scheme available to purchasers. 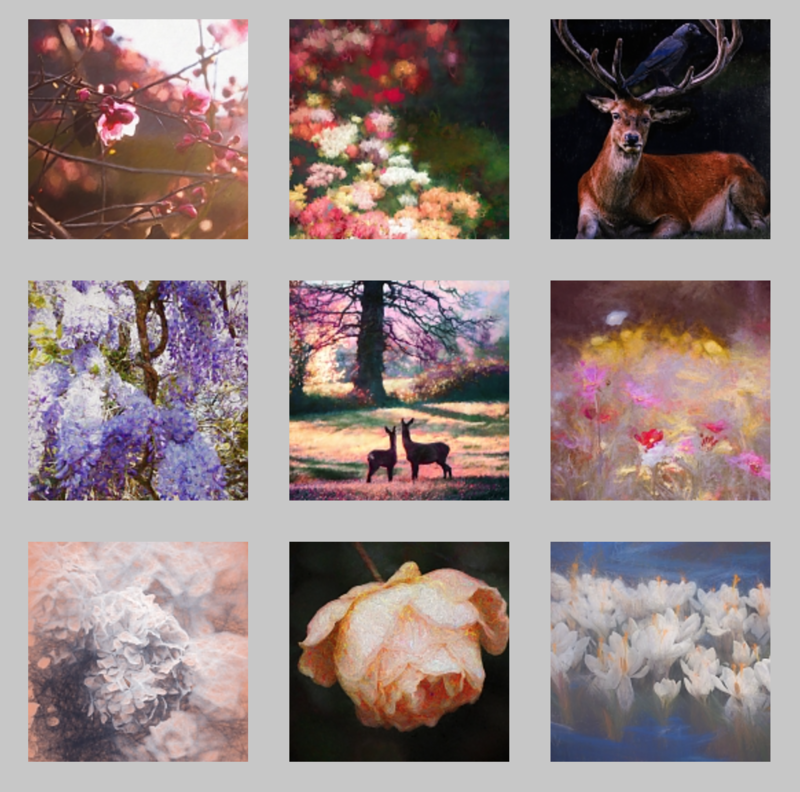 Canvas prints and card orders of my work now available from a UK fulfillment centre (in addition to the existing one in the US) via Fine Art America which means orders are dispatched within one day to UK addresses and 2-5 days to anywhere else in Europe…plus low shipping costs and no import taxes close to home. See my website for ordering information. A tiny painting of the rolling hills I often walk near home raised £185.00 for the charity STEPS supporting children and adults affected by lower limb disorders at a local auction…even though the event took place outside in the rain. Great outcome! This entry was posted in Art, Art as a business, Art technique, Consciousness & evolution, Culture, Health & wellbeing, Life choices, Lifestyle, Painting, Personal Development and tagged alliums, bees, enthusiasm, following your passion, gratitude, inspiraton, inspiring others, living your bliss, synergy. Bookmark the permalink. Beautiful painting Helen and congratulations on your achievements!